Christmas is just around the corner, and who couldn't use a little extra cash for the holidays? I'm so happy to be a part of a great group of bloggers who, along with me, are making it possible for YOU to win $50 EVERY FRIDAY? 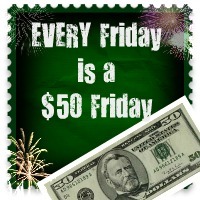 The great thing about the $50 Every Friday giveaway is that it lasts only 24 hours. That's right! No waiting for dayss or weeks to see if you won. The giveaway begins THIS FRIDAY (December 2nd) and is ONLY opened from 12:01 am and will close at 12:01am on Saturday, so it is only OPENED ONE DAY! This week you have an even better chance of winning because we have TWO groups of $50 Friday's – Group A and Group B. This week's $50 Friday will be for BLOG Follows, so feel free to "follow" any and all of the following BLOGS now, via GFC, Google +, RSS, and/or email, so that you are all set. Remember, in order to win, you have to follow ALL participating blogs via Google Friend Connect, Google+, Email, or RSS. If you find it too much to follow at one time, just make a note of where you stopped and space it our over the 24 hour contest period. Sign up for my daily emails – by clicking here… this will ensure that you will get an email letting you know that the giveaway is up. Mark your calendar – to come back here EVERY Friday to enter! COME BACK this FRIDAY to ENTER! 50 Buck Friday G!iveAway - 24 Hours Only! 50 Bucks Can Be Yours This 50 Buck Friday!